Whilst purchasing motorcycle gear, high quality, well fitting gloves can often be overlooked. Gloves play a very important part for any motorcyclist. Fingers are vulnerable to cold, especially being at the front whilst riding a motorcycle. A good quality pair of gloves will keeps your hands and fingers warm and insulated against wind and rain. Protection against injury is of course an important factor. If in an unfortunate circumstance you fall off your bike, our first reaction is to use our hands as first impact to protect the body and head. Never be tempted not to wear gloves whilst riding – even on the hottest of days. In the event of an accident, sliding along a road with bear hands will sustain a large degree of damage. Gloves made from inappropriate materials not designed for motorcycle riding are also unlikely to withstand sustained friction and burn from a slide. Leather gloves tend to provide the best protection against injury. Some gloves will also come with armour embedded into the leather to increase resistance to friction, burns and impacts. 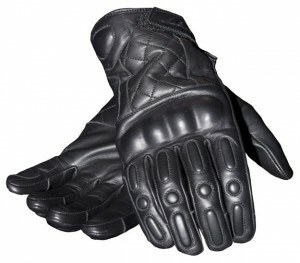 Motorcycle gloves will typically be combined with modern materials to make them waterproof, comfortable and warm. It’s important that you try on gloves before purchase. Gloves should have a tight fit but allow for enough room that you can easily operate controls. Gloves that are too tight may inhibit your ability to move hands and fingers freely, and too lose obstruct hand / finger movement and may be prone to slipping off. 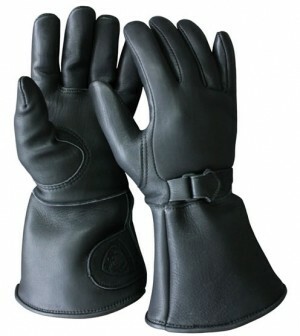 Good quality motorcycle gloves are often waterproof to an extent, though may begin to leak or become saturated in prolonged wet weather riding. Overmitts or over-gloves provide a 100% waterproof thin glove that is worn over your normal gloves, typically with an adjustable wrist strap. They are generally made from nylon or cotton that include additives for water resistance. Again, as with normal riding gloves, test overmitts to ensure the fit is correct. Gauntlets are the classic style of glove still worn by some motorcyclists today. Modern versions of the gauntlet glove utilise adjustable cuffs by use of straps or pull-strings to aid in the protection against wind and heavy rain. Don’t be tempted to wear casual shoes, trainers or sandals whilst riding a motorcycle. Tempting on hot days as it may be, in the event of an accident, your feet or ankles can easily become crushed under the weight of the motorcycle, heavily grazed or injured due to impact. 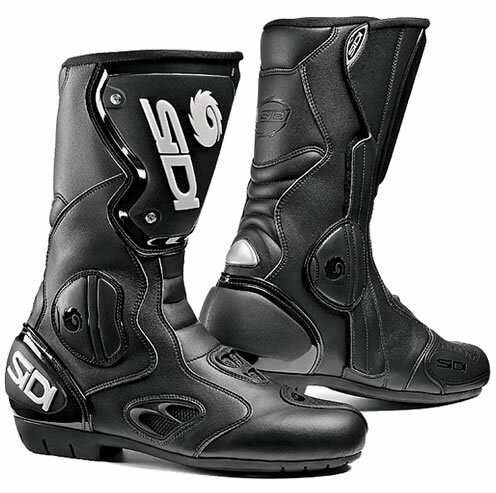 Quality motorcycle boots offer much higher levels of protection during an accident compared to normal footwear. Boots are well built from leather, rubber or plastic or may feature a combination. Modern combined materials offer excellent water resistance, friction resistance and a certain level of protection against impact. Some boots will feature armour helping to protect toes, heels and ankles. When looking for a pair of boots, ensure they provide protection for above the ankle and are made from modern materials that offer water resistance. Don’t forget you’ll need to walk in them too. Other than ensuring they are comfortable and that you can operate foot controls effectively, ensure they are comfortable to walk in. Motorcycle boots can be secured in place by laces, Velcro straps or zips. Velcro straps are generally the preferred method as they are quick to put on and remove, plus they eliminate the potential danger of laces coming undone whilst riding. If you prefer boots with laces, always ensure they are tied tightly and thoroughly secured before each journey.